Destructor is a powerful distortion and amp sim modeling tool capable of simulating ANY kind of distortion you can imagine. Delivered with hundreds of presets and predefined models, either inspired by existing gear or created by your destructive mind. This plug-in is not limited to predefined models: all parameters of existing presets are fully editable, which gives you access to an unlimited number of distortion simulations – no need to purchase extra presets or amp models to build your custom tone. The plug-in can be loaded into Blue Cat’s PatchWork to be used as a standalone application, where it can be combined with other effects to build your tone even further. 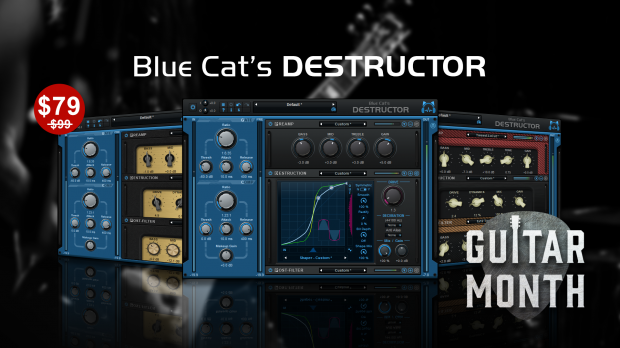 This entry was posted in DontCrack, Plug-ins, Promotions and tagged amp sim modeling tool, Blue Cat, Destructor, Distortion, distortion simulations, Guitar amp emulation, Guitar tone, PatchWork. Bookmark the permalink.